Jon Ashton picked up a bunch of chubby carrots from farmer Patrick Holland’s table at the Founders Square Farmers Market. A celebrity chef originally from Liverpool, England, Ashton has made numerous TV appearances and traveled, cooked and tasted foods from all over Europe and Asia. 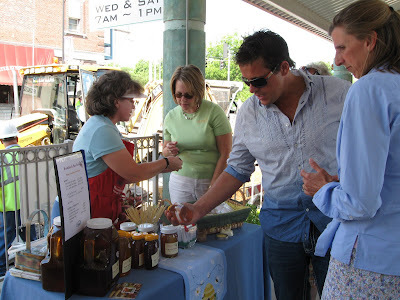 But he felt right at home in a small-town American farmers market. “This is more quaint than pushing a shopping cart through a place where every 15 minutes there’s a thunderstorm and the mist comes down on the produce,” he said. Ashton will be the host at the Relish Cooking School & Expo to be held at 7 p.m. Sept. 11 at the James E. Bruce Convention Center. The event will feature a variety of food and home related exhibits and hands-on activities. Those who attend will also have the chance to win a $10,000 kitchen makeover from Cayce Mill Supply. Ashton visited The Kentucky New Era and Hopkinsville recently to scope out the surroundings and prepare for the expo. Locally grown food and nutritious eating are among Ashton’s passions. He has a kitchen garden of his own at his Florida home and loves cooking up meals for his neighbors with his homegrown produce. Ashton also agrees with Holland that plants will thrive with some tender words of encouragement. But getting to know his veggies on a first-name basis doesn’t stop Ashton from eating them or sharing the bounty with friends. The chef requires no encouragement, he was craving a salad with mint, lemon juice and tomatoes for lunch. He also recommends oven-drying garden tomatoes to intensify their flavor. Full of vitamin C and the anti-oxidant lycopene, the nutrition conscious cook couldn’t praise the tomato enough. 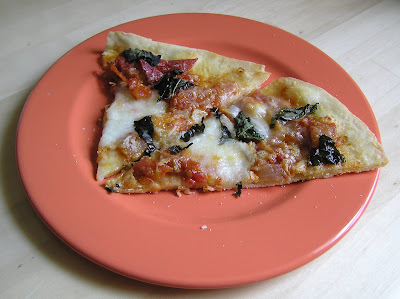 Another way to enjoy the tart vegetables is on a thin-crust pizza reminiscent of the snack served in Sicily. “This is a wet dough, after it has proofed it will be easier to handle,” Ashton says. He believes cooking the crust on a clay stone in an oven that’s been preheating at 500 degrees at least 30 minutes will produce the most authentic results. 3 3/4 cups bread flour, plus additional for rolling out. Coarsely chop basil, onion, garlic and tomato. Sauté garlic and onions in oil. Once fragrant, add tomatoes and ¼ cup basil and oregano to taste. Cook down until most of the juices have evaporated. Mix dry ingredients with fingers and make a well in the center. Add wet ingredients and knead. It makes a really sticky dough. Knead for 7 to 10 minutes. Divide dough into four balls. With each ball, push out the dough with the heel of your hand to stretch it. You’ll see the strands of yeast. Then roll out to the thickness of a tortilla. The shape doesn’t need to be perfectly round. Let the dough rounds rest 30 minutes. Use a dusting of cornmeal on the bottom of each crust to keep them from sticking. Brush the top with oil. Add garlic, salt and pepper, homemade tomato sauce. Cook pizza on the clay stone for 6 minutes. Then bring it back out and add basil, real buffalo mozzarella and reggiano-parmesan. Return to the oven until cheese is melted and basil crispy. Tickets: $10 general admission or $25 V.I.P. admission which includes cookbook, up-front seating, and pre-show “Meet, Mingle, and Munch” with Jon. A $2 discount applies for New Era subscribers if tickets are purchased at the New Era. Tickets are available at the New Era, Cayce Mill Design Center, the James E. Bruce Convention Center and the Fort Campbell Courier office. Some lucky New Era reader could share the stage with celebrity chef Jon Ashton on Sept. 11 during his appearance at the Relish Cooking School and Expo, sponsored by the KNE. Send us your favorite recipe and, if it’s chosen the winner, Ashton will call the local cook on stage for assistance during his show and the recipe will be distributed to everyone attending the show to be held at the James E. Bruce Convention Center. Choose whatever category you’d like – appetizer, drink, salad, soup, entrée or dessert. Many of the recipes will be featured in a special KNE cooking section on Sept. 4. Send the recipe to KNE reporter Julia Hunter at Box 729, Hopkinsville, KY 42241. Recipes must be received by Aug. 20 and must include the submitter’s name, address and daytime telephone number. This was actually almost two weeks ago, but I've been a busy girl lately. I'm pretty good at chowing down at my desk. 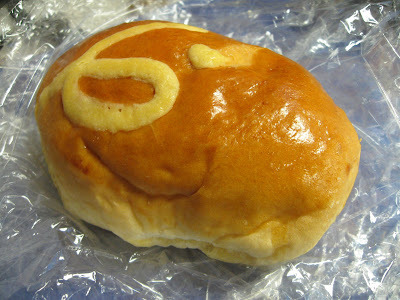 Here's a Chinese bakery coconut bun... mmm. Full of saturated fat, but really tasty for an every so often snack. Yesterday I bought a 50-cent brownie at the Founders Square farmers market from Patrick Holland's stand. He and his wife are into natural farming and making lots of healthy baked goods. 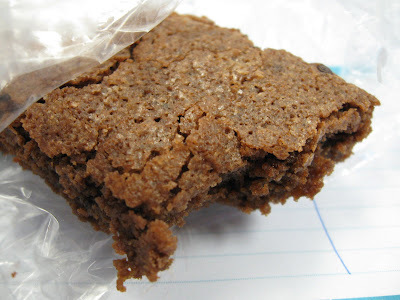 I think they used the bigger grained natural sugar, giving the brownie a really nice crunch. 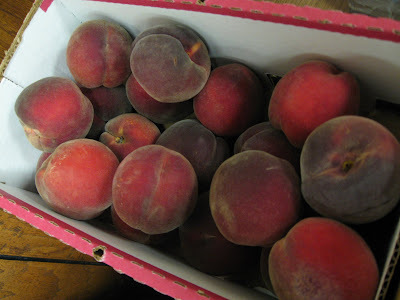 I bought this box of peaches at Bradford Square farmers market on Tuesday from Luke Lovell's stand. These are mixed with plum, giving them a darker skin and a slightly plummy taste. I did a fair amount of cooking yesterday, trying to use up some of our fresh produce and other foods in our fridge. I found lowfat, low sodium ramen noodles that are baked instead of fried at Kroger on Sunday. I bought three packs... they're 49 cents each, as opposed to 20 cents for the scary fattening version. Of course they don't taste as good, but good enough that I'd buy them again. I've been wanting to make this dish out of my Martin Yan cookbook for a while, but even though it's supposed to be a simple recipe, there's a couple things that make it labor intensive: have to make the cucumber salad (which is actually a beansprout salad in Yan's version), have to make the marblized tea eggs (mine were just soy sauce eggs), have to marinate, dredge then fry the pork chops, and you have to make the noodles (the easiest part of all). I was going to make the dipping sauce, but I was really tired so I skipped it. Once everything is made, I guess it's pretty easy to assemble for the next day's lunch, but of course the pork chops taste best when they're still hot and crispy. Still lots of cucumbers coming in my little row of the garden out back. I also have tons of tomatoes...but none are ripe yet. Here's a nice picture of a cucumber, picked just after a rain and my swollen foot in the background. I wonder if cucumber slices work on puffy feet? I don't know if birds have temper tantrums when they're young. But if they do, this might be what it looks like. I don't think it did. How sad. I was really shocked to find that I've actually grown some real, edible vegetables. Four large cucumbers have been hiding out under those big fuzzy floppy leaves, and I didn't even know it. When I spotted the first one, I couldn't believe what I was seeing. I thought it was one of the neighbors cucumbers that somehow landed among my plants. But when I grabbed it, my plant moved with it. They have some of those pokey hairs, but once scrubbed with a coarse sponge, they're just like the grocery store cucs. Lots more on the way. Also picked my first lemon boy tomato...which is sort of a siamese twin. One side was yellow and there was a crack forming on the green side. Didn't want it to rot, so I picked it before it was fully ripe on both sides. My patio tomatoes aren't doing too bad either, though I need to prop them up with some more doll rods. I bought this giant patty-pan squash from a middle eastern couple. I was really taken by it because the patty-pans I've seen are all in summer squash and zucchini colors. Plus it was giganto. The corn is a stress-squeezer that my mom got from teh UK extension office table... where they were also cooking free samples of corn and zucchini saute, beet salad and green tomato salsa. Yum! Last night we went to Tokyo Sushi, near Paducah's mall, before hitting downtown after dinner. I had the dragon roll and a seaweed salad (eaten too fast to photograph.) The salad was just right- vinegar sugar and sesame oil dressing coating a mix of thinly chopped seaweed, jellyfish and green onions. Sprinkled with sesame seeds and strips of nori. My roll was also good: eel, cucumber and avocado. Joe had a roll with salmon, avocado and cucumber and two flying fish roe. I didn't try them, though I wanted to, because of the risk to the baby. Mom and Dad had teka maki, udon and some other kind of roll... but I've forgotten what. We all enjoyed our food and it was fairly reasonably priced. Yesterday at lunch we ate at Kirchoff's deli, attached to the famous bakery. Their portions are generous and they have quite a variety on the menu. I had a falafel salad.... the falafel was tasty, but not really authentic in texture. I thought the rest of the salad was kind of a dud: Really huge pieces of romaine, slightly red on the edges. One big tomato wedge and one big cucumber round and some dried out shredded carrots. Probably the tastiest part was the big bowl of feta, but again, since I'm avoiding the various bacteria carrying pregnancy no-nos, I didn't eat any. The yogurt dressing was kind of boring. I added lemon juice to it to give it some zing. Joe and I split the salad and a portabella sandwhich, which was good, but salty and messy. The chopped mushroom and red peppers were cut too finely, so they were falling out everywhere. Mom and I split a lemonade cookie, which was basically a very soft, fat sugar cookie with yellow sugar on top. I liked it, but there was the slightest taste of too much baking soda and not really any lemon flavor. Still, it was a good end to the meal.